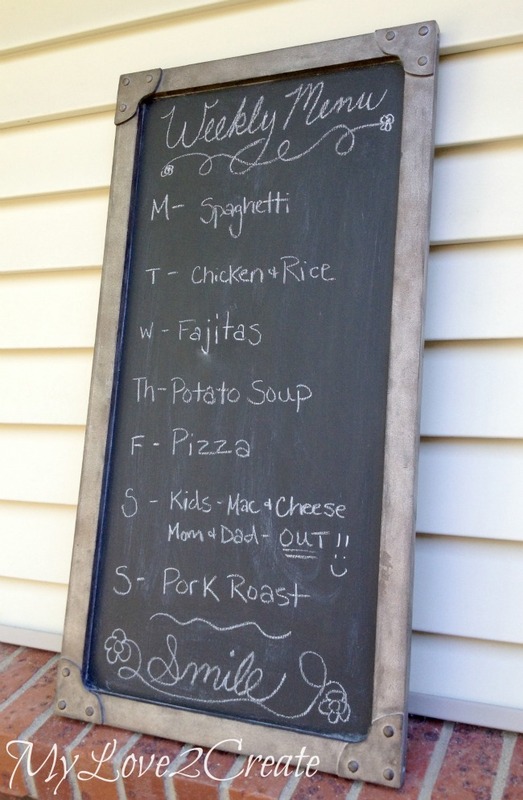 It has been fascinating for me to see how popular chalkboards have become. In the past few years they have really taken off, and you see them on just about everything. 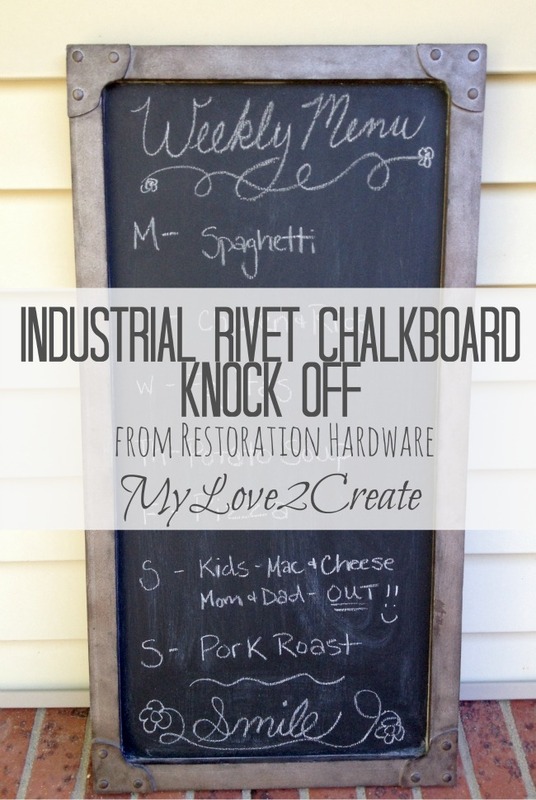 So...When I first spotted Restoration Hardware's industrial rivet chalkboard I fell in love. It was simple and just cool industrial. 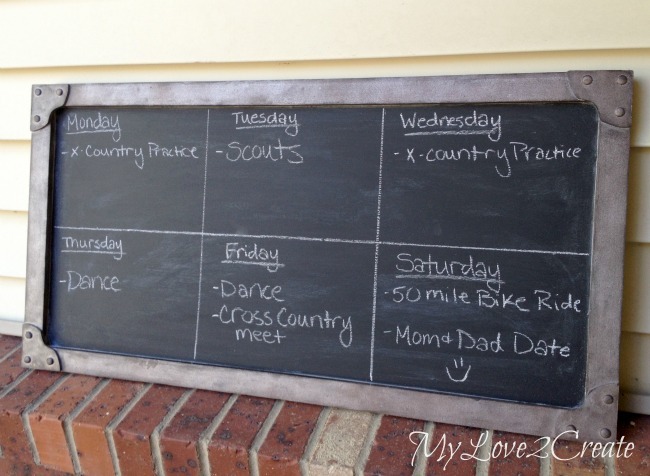 I have been using this knock off chalkboard for a few months and love it! 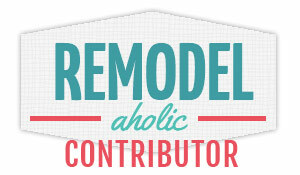 It first appeared on My Repurposed Life, where I contribute twice a month. My wallet could not afford the RH price tag $399, so I set off to make my own. 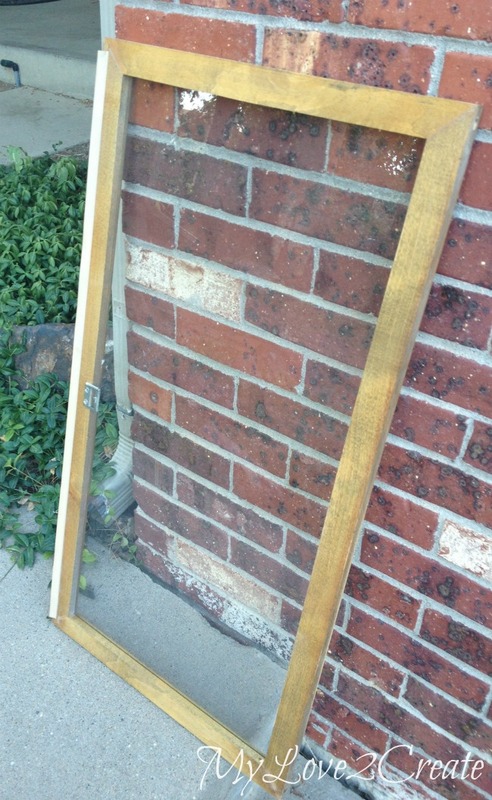 As luck would have it my friend had given me some old windows that she had removed from her basement, so I grabbed one to use, and it was the perfect size! I removed the rubber strip and the metal thingy. 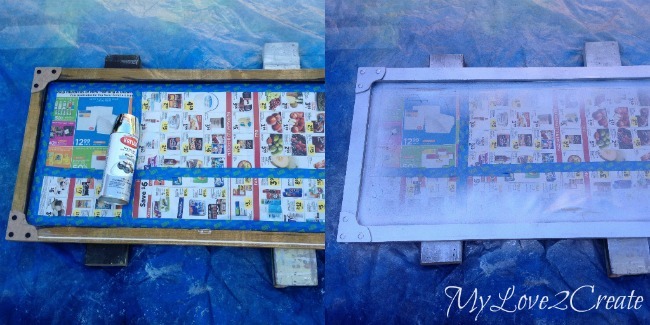 Then cleaned it up and gave the glass 3 or 4 coats of Rust-Oleum Chalkboard Paint . Once the last coat of paint was dry I set out to do my fake metal and rivet corners. I chose a scrap piece of chipboard 1/4 inch thick and drew on a pattern. Then I stacked three more pieces of chipboard under the patterned board, clamped them down, and started cutting out the pattern with my jigsaw. When all cut, I kept them together to sand smooth. Not too bad. You can also see I filled in the crack where the rubber thing was with spackle. 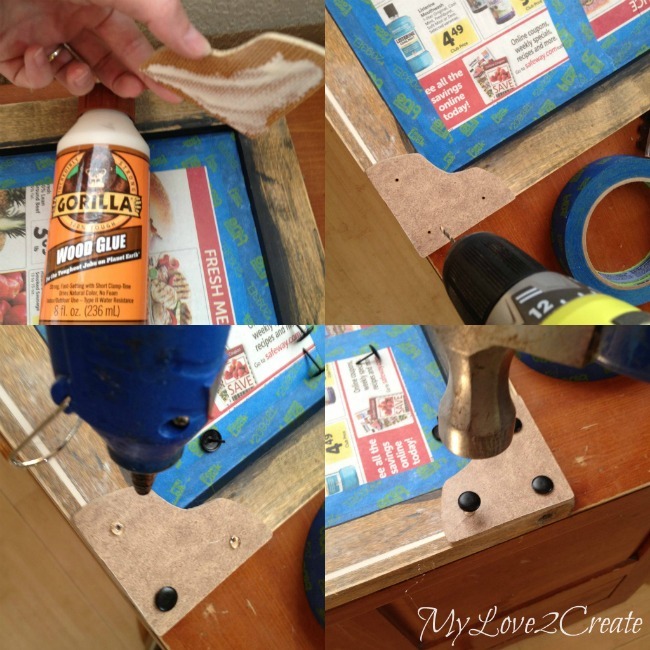 Next up was gluing down the corner pieces, I used Gorilla wood glue and set them where I wanted them. 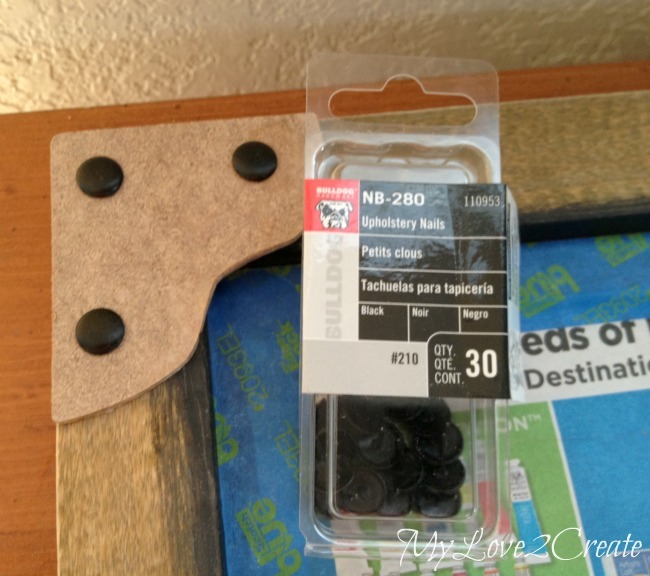 Then, to avoid splitting the wood, I drilled holes for my Upholstery Nails/tacks . Before I hammered in the tacks, I added a dab of hot glue, to make sure they were nice and secure. Since I have a stash of half empty spray paint cans, I was lucky to find the colors I needed to do my "metal look" on the window frame. 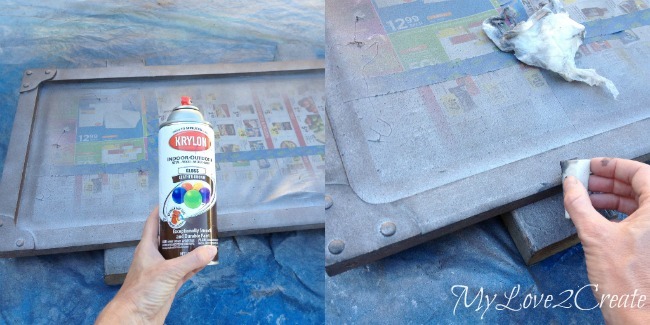 I started with some Krylon Silver, and sprayed it really well. Then with some brown I sprayed from really far away to give it a speckled look, to age the shiny silver. Last, I got a sponge and dabbed it it black paint (acrylic or latex) and lightly rubbed it on the edges around the frame. If it looked too dark I used a wet paper towel to blend it in. This gave the frame the dark industrial metal look. It isn't totally perfect, but close enough for me. 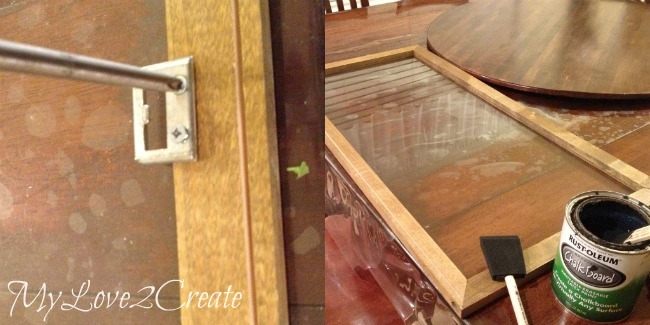 Everything I used for this project I had on hand so my RH Knock Off was completely FREE!! I have so many ways I can use it, as a calendar. Or just for quotes of inspiration on my mantle. So many options, and if I ever get to doing my oldest boys room...that is probably where it will end up...eventually. I am quite happy I attempted this knock off, and it has been fun to have in the kitchen. 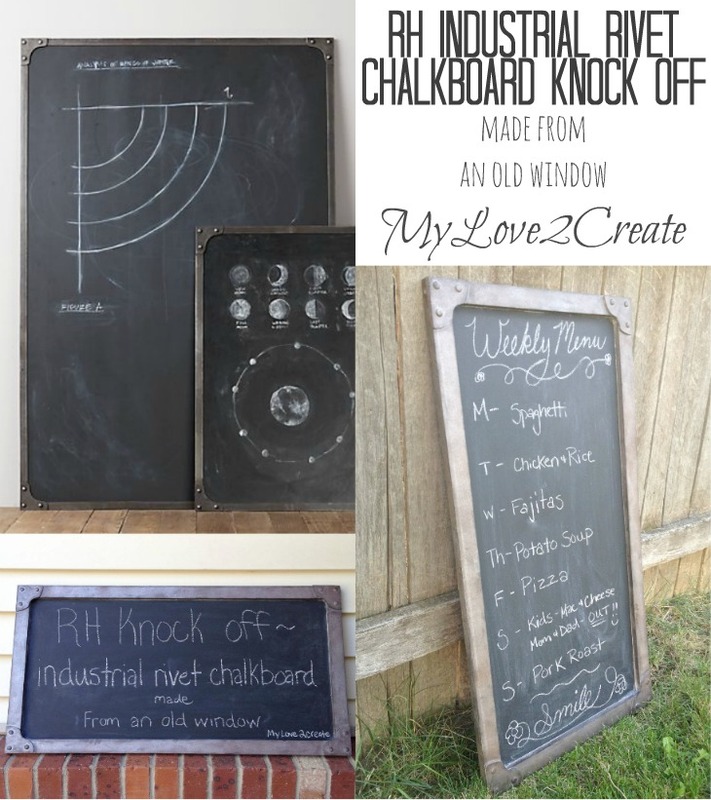 Are you as taken with Chalkboards as I am? 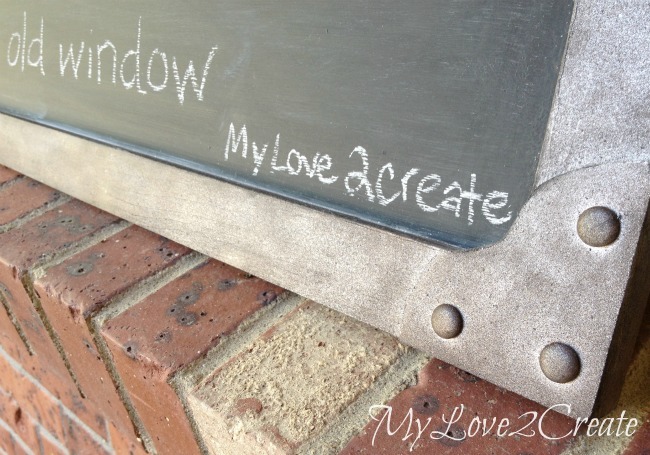 It is hard for me not to paint them on all my projects, anything that needs a label could use some chalkboard paint...right!?! Oh, and if you like knock off projects, I just shared a Christmas Sign Pottery Barn knock off last week! I love it! It does have the industrial look. A most creative knock off of the RH version. Very nice. Kudos to you! I love everything you do Mindy! Seriously, this is pure awesomeness! I hope you will link it up to next Tuesdays party ;) I'm pinning right now! 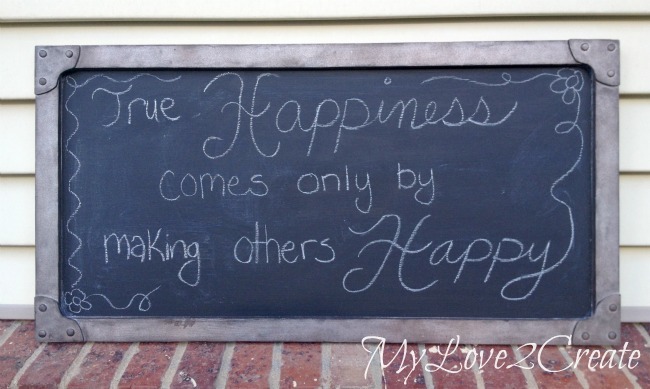 I love chalkboards too and c'mon this one is awesome! I love it! the rivets are so cool. 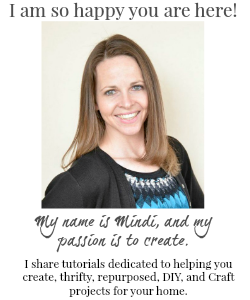 You're giving me great ideas, Mindi! really? this is truly amazing. Love all your knock off projects. Free (or almost free) is best! 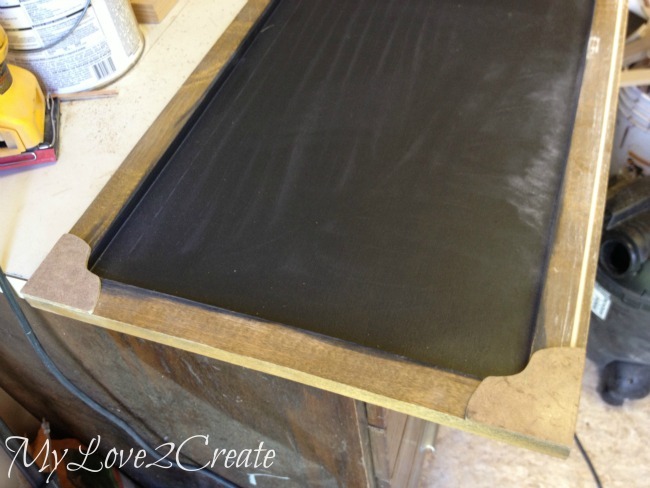 Great tutorial on making chalk boards.....they are so useful. Thank you for sharing with the Clever Chicks Blog Hop! I hope you’ll join us again next week! I love this look and I love a good knock off project! Thanks for sharing at Vintage Inspiration Party. This is very cool! I love chalkboard paint as much as anyone. However, I would be concerned this is painted glass. Someone may not know it is glass and it seems a little dangerous.